Finally, a finished object to show. This is item number 6 for 25 Things for Charity as always it is going to Hottentots Holland Hospital, I’ve got three items to hand over this month. It’s a little hat to match the cardigan. This yarn is Lorna’s Laces and was donated to me to use for charity. 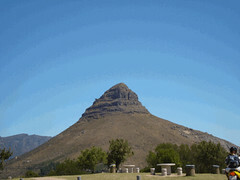 After Monkey Town we went to a nature reserve for lunch, there were tortoises and bontebok (antelope) there. The bontebok had a baby with them and was very cute. Currently one of our students has his parents visiting and they went nuts with the video camera. I suspect that the mother may be a knitter, she saw me with the dpns and smiled, nodded and patted her foot (she speaks zero English, just Spanish) I said no and patted my head. That was as far as we got, and her son doesn’t have enough English (yet) to translate. We had our first session today: A month of school and she has 4 pages of work to show in her English book. I asked her if this was all the work she’d done. She indicated that it was. I then asked what they did in class, her response? I’m singing with a small group on Friday, so we’ve been practising pretty intensely. They are all rather talented so it should sound good. I’m going to have to cut back on the amount of performing I do this year though, I’m just getting too tired and run down. I have an inch and a half left on a sleeve (knit in the round so there’s no seaming) and I cannot find the energy to finish it. I did put in 12 hours at work yesterday, so was just a little tired when we got home, ok, I fell asleep on the couch while Gorgeous Man made dinner. I did a little reading on the weekend and finished book number 12 for the year. I’m not including magazines or knitting pattern books in this count. Book 12: Country of My Skull – by Antjie Krog. Krog was a reporter for the Truth and Reconciliation Commission here in South Africa, and the book is a result of her experiences. This book took me a while to read, it’s not the sort of book that you can read for any great length of time as the sheer human suffering, narrated in such matter-of-fact language (she uses the voices of the victims and perpetrators wherever possible) is at times difficult to bear. It also looks at the effect of the commission on the reporters and translators. She is a white Afrikaans South African and in many ways the book is about herself coming to terms with how much her language and culture, that she loves, has contributed to the trauma that was Apartheid. She received death threats from white South Africans during the TRC. This book was made into a film in 2003 starring Samuel L. Jackson. If you want to understand (a little better) South African history and race relations then this is a book you should read. Thank you for all the nice comments on my 100th post. There’s nothing really profound to say, or exciting (craftwise) to share in this post, so I’ll use it to catch up on a few things. I’m having problems with comments being delivered to my in-box, so if you’ve left a comment and I haven’t replied it’s because I’m having technical difficulties, not because I’m ignoring you. On the computer front I’m also having problems emailing Samantha and Beth, my emails keep getting bounced back as undeliverable. The girls night out was fun, but we didn’t get to see a movie. We tried to pre-book the tickets (since it was Chick Flick Thursday and you get free stuff, it sells out pretty fast) and found that we couldn’t pre-book on-line, or by phone. However, when we got there we were told all of the tickets are gone, and that we should have pre-booked. This is the second time this has happened to us. We went shopping and had dinner and then went home and had a great time catching up, so it was fun. 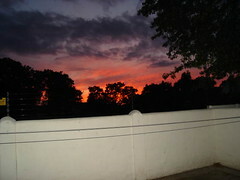 We booked our June holidays on Friday – 4 nights at Kruger National Park. I’m just a little excited! The accommodation was surprisingly less than I expected, and we will drive there which will save money, and give us a chance to see more of the country. I found a Debbie Bliss knitting book on special on Sunday How to Knit. I’m thinking of expanding my knitting horizons and trying some colour work and this had a good ‘how to’ section. I’ll try to have some knitting or quilting pictures tomorrow. I’m very close to a knitted finished object. I took a class to learn how to machine quilt. The teacher was very talented this is the reverse of one of her sample quilts. 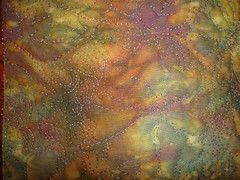 Another sample of her work, all done on a domestic sewing machine that is 2o years old! Her quilts sell in galleries and she is preparing for an exhibition in the Isle of Mann. Learning has always come easily for me, except in the area of art and sewing, and this combined both. I have to say it was a new experience for me to be the dumbest in the class. had two and so lent me one for the day. I learnt some useful things, but I feel that I was written off very early and that I wasn’t given as much guidance as I would have liked, mind you I’m not sure that much would have helped me. I was having trouble controlling the material under the free-motion foot and was told that it was more difficult for me because I don’t have a table attatchment for my machine. Now that may be true, but my machine was made in Australia and I’ve not seen any here, so the chances of getting a suitable table are slim to none, I need to learn how to work with the machine that I have. Also other ladies were there without the fancy tables and they were managing ok…which leads me to think that there may be a technique involved. I did learn how to tack/baste a quilt together properly (I’ve only ever used pins before) I think not having the quilt quite so heavy with the pins will make a big difference for machine quilting in the future. I also learnt to do some really cool things with my walking foot. I think the controlled geometric stuff appeals to my control-freak nature a little more than the free motion stuff. I can’t draw on paper, I can’t meander on paper without getting hangnails and hooks so expecting to be able to do that on machine is expecting a bit much. I don’t think that this is a skill that I’m going to be able to master, and to be frank I’d rather be piecing a quilt or knitting than practicing. There were a few designs with the free-motion stuff that I’ll do, but they are more geometric than most of the designs we were taught. I was surprised to hear her say that taking in other people’s quilts and quilting them was like prostitution, and giving away your talents, since people never acknowledged the quilter. She was talking about the sort of stuff she does on a domestic and not long arming, but I still raised my eyebrows. I guess everyone is entitled to their opinon. I enjoyed the course, it was a good lesson in humility and I know that I won’t feel bad sending a big quilt out in future to be quilted. I learned a lot of tips and things about quilting that I wouldn’t have otherwise learnt, and I learnt that the artistic stuff isn’t my style. I’m going to the movies tonight. It’s chick flick Thursday, it’s a movie I don’t really want to see, I’m not into chick flicks, but it’s an evening out with my friends and the cinema provides all the women at “Chick Flick Thursday” with a free goodie bag of womens’ stuff. 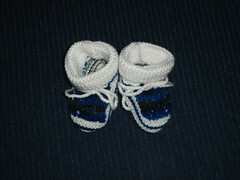 I did a lot of sleeping this weekend, but I did manage to get these little booties finished. Not the best picture, they are not so dark in real life. 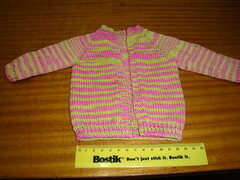 These were made with the donated yarn from Shelly and are destined for the babies at Hottentots Holland Hospital. I was holding my breath while knitting the blue on these. I literally had an inch spare at the end of the coloured section. I also laid out my quilt ready to baste together. I’m taking a course on how to use your sewing machine to quilt and need a quilt top and/or a practice sandwich. I’ll be taking both. I’ll show pictures of the quilt when it’s all together and before quilting. It’s one I made before I started blogging, so it hasn’t had a public showing yet. Please excuse the back fence and clothes line, but this is the best one with the colours. 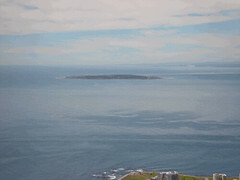 We are back to nice warm weather, so knitting will be on hold for a little while again. 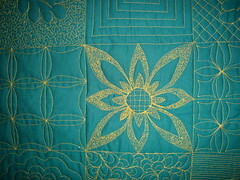 Which is ok, since I still have some applique blocks to do for the African quilt. 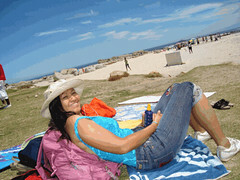 Today was ‘outing day’ for work, we took the students to Camps Bay Beach and they got to spend some time in the sun. 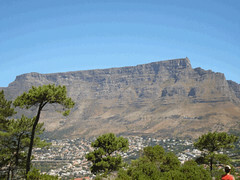 The students seemed to have a great day, and the weather was perfect, not too hot, but not as cold as last week. 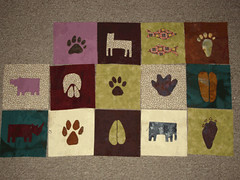 Last night I laid out the blocks for the animal quilt that I’ve done so far. I’m halfway there. These blocks get spaced with unappliqued blocks and strippy sashing. I’m really pleased with how they are turning out, though finding an applique class is high on my list of priorities. I’m enjoying the process and want to learn how to get the best out of my time and effort. Yesterday we left work very late and decided to stop and eat out. Gorgeous Man and I felt like fish and so stopped at a seafood restaurant on the way home. So I repeated myself. Turned out he had been speaking English to me. “Australia” at this point I look over and there is Gorgeous Man with his head in both hands trying not to laugh (or he might have been trying to look for a place to hide). Turns out he had asked if he should pour my drink into the glass. We decided that it would be best if I didn’t speak to the waiter for the rest of the meal. Apparently I need a translator to understand English. The sad thing is I’m an EFL teacher and spend all day every day with non-English speakers. To the young man who was our waiter at John Dory last night, I’m sorry I couldn’t understand what you were saying. Please know that there is nothing wrong with your English. I was really tired and the music was distracting. Do you think I need to go for a hearing test? PS: When did I get so old that I’ve started referring to someone as ‘a young man’?